Gary Stevens won the final race on Dubai Duty Free Shergar Cup day when Annunciation, trained by Richard Hannon, won this sprint for three-year-olds. Stevens, whose mount produced a late thrust that narrowly deprived fellow American Rosie Napravnik on Noble Deed, took his personal tally to 18pts, although his team, the Rest of the World, could finish only third in the competition with 46 points - the winning Europe team amassed 97 points. Stevens, for whom this was a 50th winner in Britain, said: "That was fun, and the only ride I've had today that played out right. The trainer wanted to try something new today and to drop him out, because he felt that was the only way he would get the trip. The partnership [owners Middleham Park Racing] didn't think much of those instructions, but they are happy now. Amazing photo! I never realized the ascent was so steep - wow! I wonder why they would have the course like that? It's more dangerous for the horses running downhill than running uphill. They are tougher over there...then and now. Horse races in England were often informal between friends, or not, and they were run from one town to another, sometimes through villages along the way. They were run over the actual terrain of the roads, up and down, threading through traffic, livestock being moved along the road, and etc. Sometimes they were ridden, but a lot were driven, which would probably have been more dangerous because of the traffic and the necessity of passing slower vehicles. The horses might have been single, in a pair, or four-in-hand. What fun. For longer races, the drivers would have other horses stationed at inns along the way for a change of horses, or they could use "job" horses, that were rented at hostelries along the road. OK...just replayed my "mental rolodex" and recalled where I heard about the uneven ground training of European race horses. It was from a DVD I bought as a souvenir this past September while visiting the Irish National Stud (INS), less than an hour drive from Dublin in the town of Kildare. The DVD is titled: "In The Blood-The Story of Irish Racing". Too bad I couldn't convince my hubby to watch a live race at The Curragh racecourse near Kildare during our stay in Ireland. 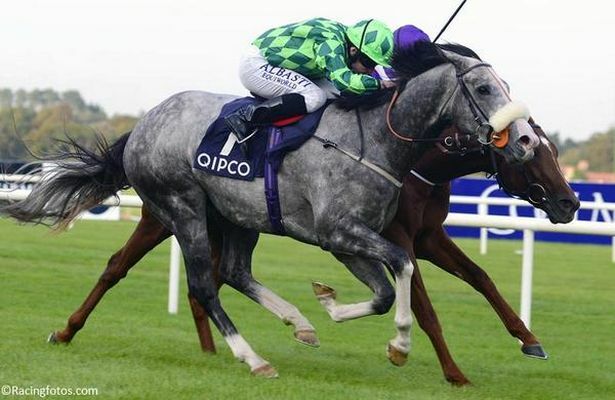 The best I could do was watch the Irish Champion Stakes race on TV where Australia lost his automatic placement for the Breeders Cup when he lost to The Grey Gatsby. The Grey Gatsby. hahaha Clever name. The racing I was referring to was back in the early 19th century when the roads were not paved, but had been improved enough to be driven at high speeds, and of course, there were only horse-drawn vehicles. Sorry, should have made that clearer. The Grey Gatsby. I love him, hes so pretty. 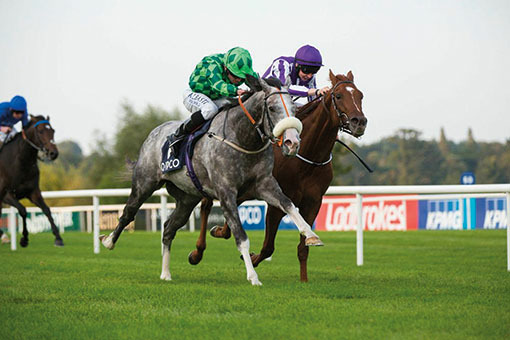 The photos above were taken at the final stretch in the Irish Champion Stakes. Australia was passed for the lead by The Grey Gatsby. It was an exciting, on the edge of your seat race to watch indeed! I was yelling out loud in my Dublin hotel room! Love the green silks of the Irish horse. Yes! Gotta go Green Silks for the Irish for sure! Talk about green: The drive out to Kildare was lush and scenic. We got to drive by the famed Curragh Racetrack. The pick up point where a driver from the Irish National Stud met us was at a great outlet shopping mall in Kildare (Kildare Village)...beautifully done like a quaint village with several designer shops there (DKNY, Calvin Klein, Hugo Boss, Juicy Couture, etc). There was an interesting ruin called the Grey Abbey (built in 1260) right next to this mall. Oops...slightly off topic-sorry! I do have photos...BUT...Didn't know if anyone on the forum would be interested in seeing these sights at or around the Irish National Stud. Maybe I could create a discussion called European Horse Racing or The Irish National Stud...idk. Will decide later. As far as training on slopes and various terrain as opposed to simply a flat track, Fair Hill Training Center in MD is the most wonderful place. Trainers like Graham Motion routinely send the racehorses in sets out on cross country hacks where they are moving up and down hills to reinforce different muscle groups as well as give the horses something more interesting to do than simply turn left a few times. If I ever had a race horse in training, it would be at Fair Hill - yeah, right - in my dreams!! It is also standard training for jumps and event horses who have to be equipped for different terrain. Best training is to combine dressage, undulating hill rides, and jumps. Even trail riding would be good for thoroughbreds' minds.